The global knee cartilage repair market is expanding due to rise in the global geriatric population and lifestyle changes coupled with growing awareness about sports and outdoor activities among the younger as well as elderly generation. The global knee cartilage repair market was valued over US$ 3.0 Bn in 2017. It is projected to surpass a value of US$ 6.7 Bn by 2026, expanding at a cumulative annual growth rate (CAGR) of over 6.0% from 2018 to 2026. The market is expanding at a relatively higher growth rate owing to increasing digitization of pain management practices, high incidences of orthopedic surgery, occurrence of neuromuscular disorders among the geriatric population, increase in knee fractures in men and women, and rise in sports activity among the young generation. Knee cartilage repair has been beneficial for conditions such as mal-unions, delayed unions, and slow healing wounds. Advances in knee cartilage repair products have fuelled this industry. However, poor or lack of reimbursement for innovative technologies, especially in developed nations, has negatively affected the market. Moreover, side-effects caused due to off-label usage of certain products and negative media literature about slow tissue recovery have hampered the market. Knee cartilage repair products are widely utilized to control physical deformities or for the treatment of injured/malfunctioned parts of the knee. They are also known as supportive of corrective devices. The primary objectives of these products are to provide comfort to patients while performing daily functions, reduce pain, support an injury, and correct the shape of a particular body part. For instance, these devices help in body movements and alignment by supporting the legs, hips, or both. Knee cartilage repair aids patients suffering from femur bone disjunction, fractures, sport injuries, or any other serious accidental injury in order to improve overall operational efficiency as well as patient care. High prevalence and incidence rates of bone and joint disorders and increase in the number of cases of osteoarthritis and orthopedic injuries among the global population have resulted in an increase in patient flow to orthopedic clinics and hospitals. These factors are projected to drive the demand for global knee cartilage repair in the near future. Moreover, expansion of emerging economies is likely to offer significant opportunities to the knee cartilage repair market in the near future. The global knee cartilage repair market has been segmented based on application, end-user, and region. In terms of application, the global market has been categorized into arthroscopic chondroplasty, autologous chondrocyte implantation, osteochondral grafts transplantation, cell-based cartilage resurfacing, implants transplant, microfracture, and others. The arthroscopic chondroplasty segment accounted for a key share (in terms of revenue) of the global market in 2017. The cell-based cartilage resurfacing segment is estimated to expand at a rapid pace during the forecast period and is estimated to report significant gains in its market share by the end of 2026. Cell-based cartilage resurfacing offer advantages such as generating cartilaginous tissue in articular cartilage defects and long-term stability of the cartilage is increasingly gaining popularity among orthopedic physicians. The microfracture segment followed the arthroscopic chondroplasty segment, in terms of share, of the global market. It is likely to maintain its dominant position and gain marginal market share during the forecast period. Microfracture is an old technique, wherein small holes are made in the surface of the joint to repair damaged articular cartilage. This type of technique is widely utilized by athletes as there is less chance of post-surgical reaction and mismatch. However, rise in sports injuries and growing preference by athletes toward microfracture fuels the microfracture segment of the global market. In terms of end-user, the global market has been categorized into hospitals, ambulatory surgical centers, orthopedic clinics, and others. Rise in health care awareness and growing importance of adventurous sports among youngsters as well as the geriatric population has led to an increase in incidence of sports-related injuries across the world. Consequently, these factors are likely to drive the hospitals segment at a high growth rate in the near future. 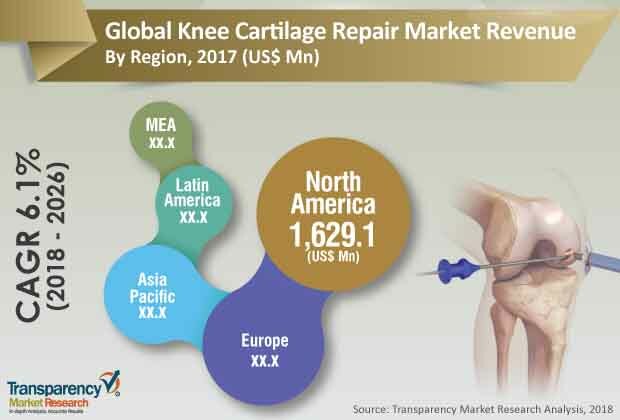 Based on region, the global knee cartilage repair market has been segmented into North America, Europe, Asia Pacific, Latin America, and Middle East & Africa. North America dominated the global market and is projected to lose market share by the end of 2026. The market in North America is primarily driven by a rapidly increasing geriatric population; high adoption of orthopedic surgery; and rise in the incidence of orthopedic disorders, sports injuries, and neuromuscular and musculoskeletal disorders among the population in the U.S. Moreover, an increase in arthroscopic chondroplasty practices has been observed in the U.S., which is projected to fuel the knee cartilage repair market in the country during the forecast period. Asia Pacific is projected to be a rapidly expanding market for knee cartilage repair in the near future. China dominated the knee cartilage repair market in Asia Pacific, while the market in the Rest of Asia Pacific is estimated to expand at a significant CAGR during the forecast period. Companies such as DePuy Synthes, Zimmer Biomet, Stryker Corporation, Smith & Nephew plc, and B. Braun Melsungen AG, were major contenders in the global knee cartilage repair market in 2017. In February 2015, Bioelectronics announced B. Braun as the exclusive U.K. distributor of pain devices for hip and knee joint replacements, spine surgery, and orthopedic trauma. This move by B. Braun promises to provide continued development of high performance products, ranging from orthopedic implants to therapeutic solutions, offering high standard of care and positive outcomes. Other global players operating in the market include Histogenics Corporation, ISTO Technologies, Inc., MEDIPOST Co. Ltd., Osiris Therapeutics, Inc., TiGenix NV, and Vericel Corporation. Market players are adopting the strategy of acquisitions and collaborations with parallel companies to improve and strengthen their geographic presence in the global market. This report on the knee cartilage repair market analyzes the current and future scenario of the global market. Knee cartilage repair products are medical devices that are used internally during surgery. They are widely utilized to control physical balance or for the treatment of injured/malfunctioned parts of the knee. They are also known as corrective devices for the knees. The primary objective of these products is to provide comfort to patients while performing daily functions, reduce pain, support an injury, and correct problems associated with the knees. An aging population and technological advancements are key drivers of the knee cartilage repair market. The knee cartilage repair market report comprises an elaborate executive summary, which includes a market snapshot that provides information about various segments of the market. It also provides information and data analysis of the global market with respect to the segments based on application, end-user, and geography. A detailed qualitative analysis of drivers and restraints of the market and opportunities has been provided in the market overview section. Additionally, the section comprises major players’ product portfolio based on brands, and products in order to understand the competitive landscape in the market. This section of the report also provides market attractiveness analysis, by geography and market share analysis, by key players, thus presenting a thorough analysis of the overall competitive scenario in the global knee cartilage repair market. Based on application, the market has been segmented into arthroscopic chondroplasty, autologous chondrocyte implantation, osteochondral grafts transplantation, cell-based cartilage resurfacing, implants transplant, microfracture, and others. The application segments have been analyzed based on available approved products, cost-effectiveness, and preference for technologies by physicians and patients. The market size and forecast for each of these segments have been provided for the period from 2016 to 2026, along with their respective CAGRs for the forecast period from 2018 to 2026, considering 2017 as the base year. Based on end-user, the knee cartilage repair market has been segmented into hospitals, ambulatory surgical centers, orthopedic clinics, and others. The market size and forecast in terms of US$ Mn for each segment have been provided for the period from 2016 to 2026. The report also provides the compound annual growth rate (CAGR %) for each market segment for the forecast period from 2018 to 2026, considering 2017 as the base year. In terms of region, the global knee cartilage repair market has been categorized into five major regions and the key countries in the respective region: North America (the U.S. and Canada), Europe (the U.K., Germany, France, Spain, Italy, and Rest of Europe), Asia Pacific (Japan, India, China, Australia & New Zealand, and Rest of Asia Pacific), Latin America (Brazil, Mexico, and Rest of Latin America) and Middle East & Africa (South Africa, GCC countries, and Rest of Middle East & Africa). The market size and forecast for each of these regions and the mentioned countries have been provided for the period from 2016 to 2026, along with their respective CAGRs for the forecast period from 2018 to 2026, considering 2017 as the base year. Market size of each country with respect to application segment has been provided for the period from 2016 to 2026, along with their respective CAGRs for the forecast period from 2018 to 2026, considering 2017 as the base year. The research study also covers the competitive scenario in these regions. The report also profiles major players in the global knee cartilage repair market based on various attributes such as company overview, financial overview, product portfolio, business strategies, and recent developments. Major players profiled in this report include DePuy Synthes, Zimmer Biomet, Stryker Corporation, Smith & Nephew plc, B. Braun Melsungen AG, Histogenics Corporation, ISTO Technologies, Inc., MEDIPOST Co. Ltd., Osiris Therapeutics, Inc., TiGenix NV, and Vericel Corporation.